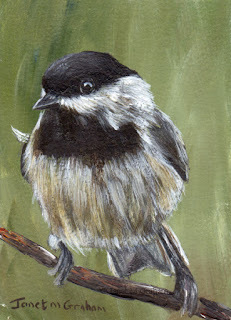 Black Capped Chickadee No 5 measures 5 x 5 inches and is painted on Colourfix Smooth paper. I love the feather colours of this one. 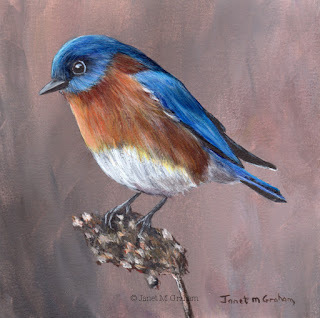 I used quite a few combinations of blue/yellow for feathers and I also went looking for my sap green tube of paint. I any ever use the sap green when painting green feathers as I usually need it for the final glazes to the feathers. 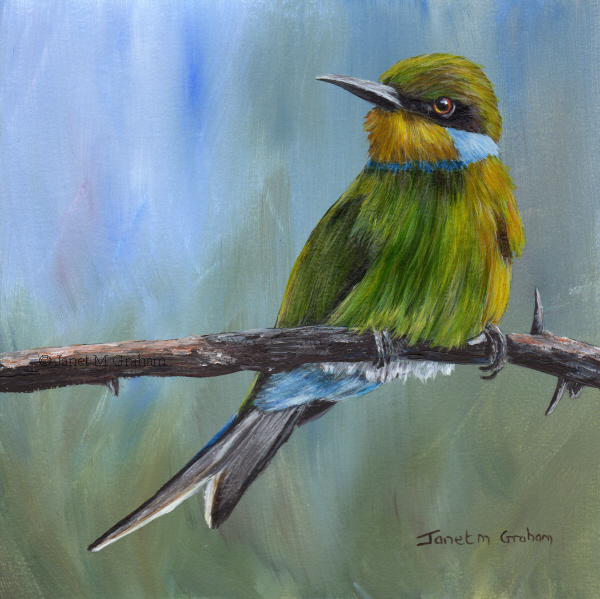 Swallow Tailed Bee-Eater measures 6 x 6 inches and is painted on Colourfix Smooth paper. I was going through my photos that I took a few year back and came across this one. I did take it from quite a distance so the quality was not that great but I really the way it is posing on the branch so decide to paint it. Rather pleased with how it turned out. 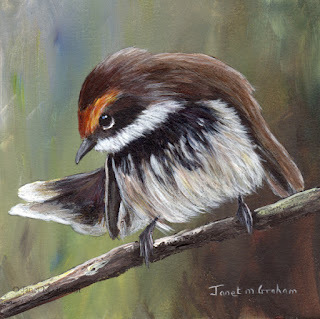 Rufous Fantail measures 5 x 5 inches and is painted on Colourfix Smooth paper. I love the colouring of this one - really pleased with how it turned out. 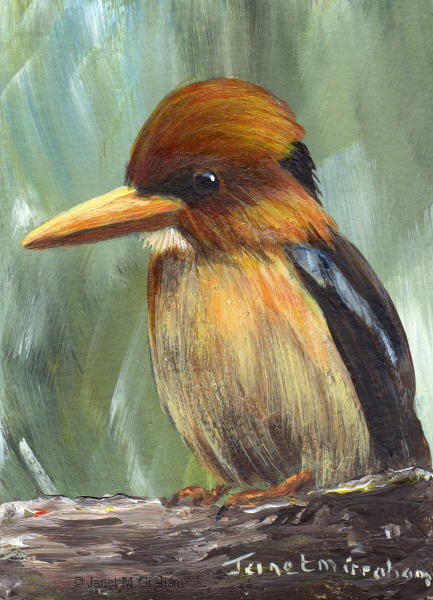 Yellow Billed Kingfishers are found in lowland New Guinea and adjacent islands and extends to Northern Cape York Peninsula in Australia. They measure around 20 cm in length and weigh about 40 grams. Yellow Billed Kingfisher measures 2.5 x 3.5 inches and is painted on Colourfix Smooth paper. Black Bellied Seedcrackers are found in Africa. They measure around 15 cm in length and weigh between 18.6 - 20.9 grams. Black Bellied Seedcracker measures 2.5 x 3.5 inches and is painted on Colourfix Smooth Paper. 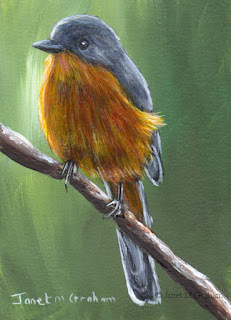 I also love how this one is perched on the branch and the angle of its head. 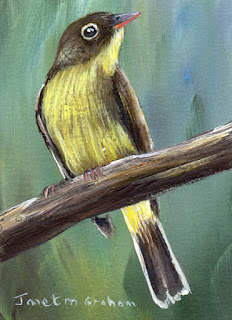 Yellow Bellied Flycatcher measures 2.5 x 3.5 inches and is painted on Colourfix Smooth Paper. 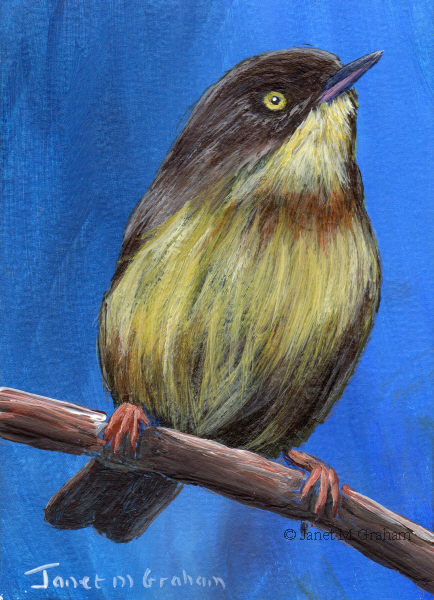 Pale Yellow Robins are endemic to Eastern Australia. They measure between 12 - 13 cm in lengh and weigh around 14 grams. 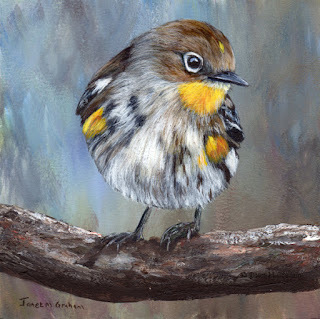 Pale Yellow Robin measures 2.5 x 3.5 inches and is painted on Colourfix Smooth Paper. 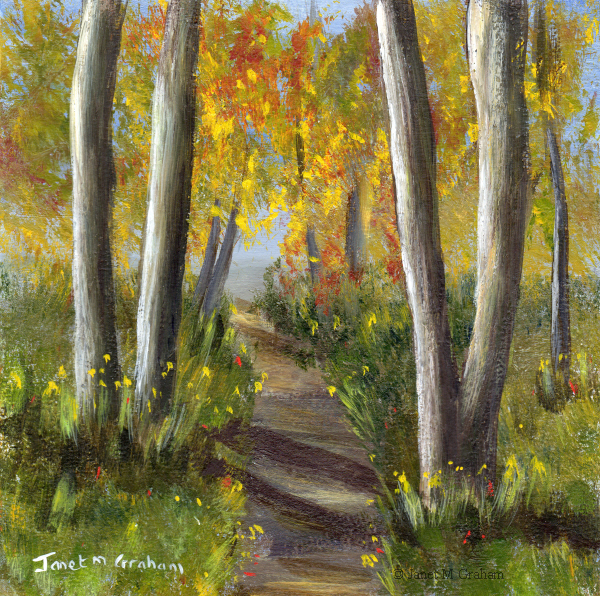 This one was rather fun to paint - everything just worked. Eastern Bluebird No 2 measures 5 x 5 inches and is painted on Colourfix Smooth Paper. Burnt-necked Eremomela's are found in Africa. They measure between 10 - 11 cm in length and weigh between 6.5 - 10 grams. Burnt-necked Eremomela measures 2.5 x 3.5 inches and is painted on Colourfix Smooth Paper. Many thanks Derek Keats for the reference photo. Silverbird's are found in Eastern Africa and measure around 18 cm in length. 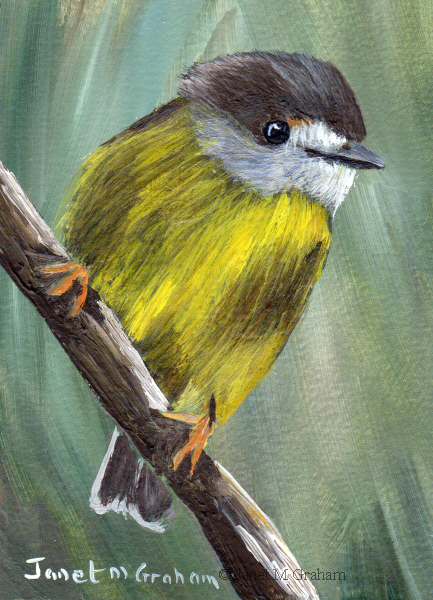 Silverbird measures 2.5 x 3.5 inches and is painted on Colourfix Smooth paper. I love the position this one is perched on the branch and the angle of its head - looks so cute. 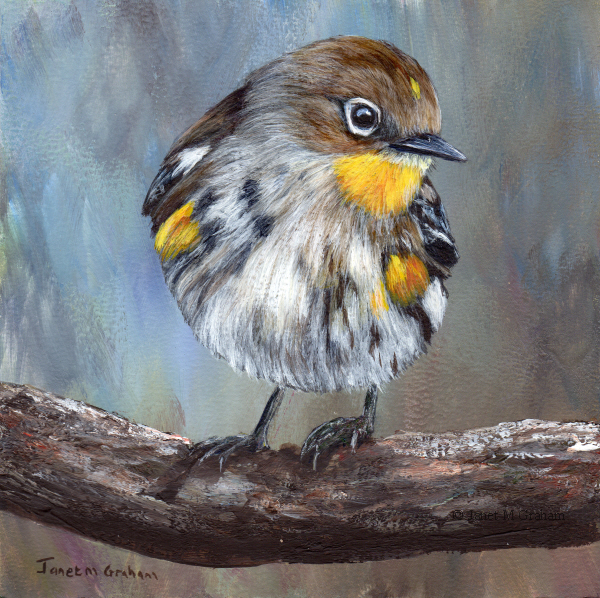 Yellow Rumped Warbler No 2 measures 5 x 5 inches and is painted on Colourfix Smooth Paper. 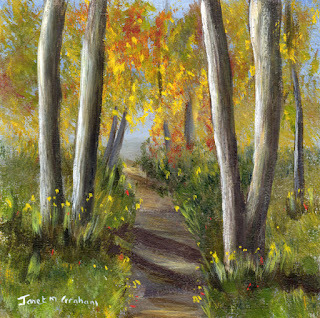 Woodland Trail measures 5 x 5 inches and is painted on Colourfix Smooth paper. I am love painting these birds - I love their feather colours and the different ways they cling to trees. 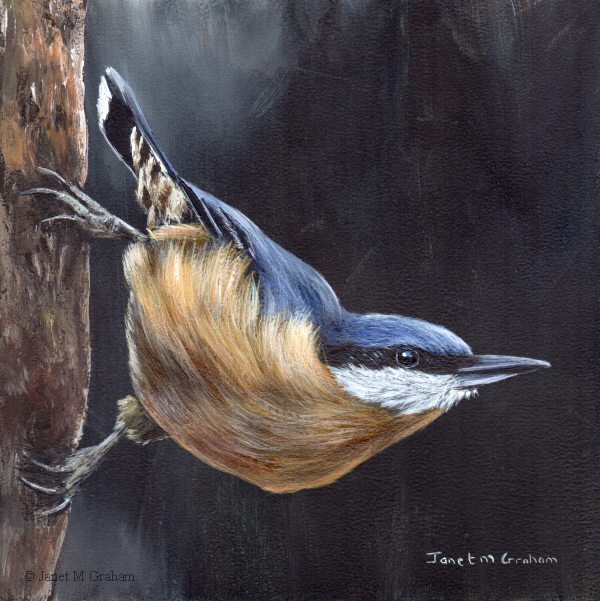 Nuthatch No 2 measures 6 x 6 inches and is painted on Colourfix Smooth Paper. 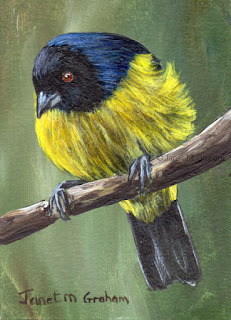 Hooded Mountain Tanagers are found in Bolivia, Colombia, Peru, Ecuador and Venezuela. They measure around 23 cm in length and weigh about 85 grams. Hooded Mountain Tanager measures 2.5 x 3.5 inches and is painted on Colourfix Smooth Paper. Caroline Chickadees are found in United States. They measure between 10 - 12 cm in length and weigh between 8 - 12 grams. 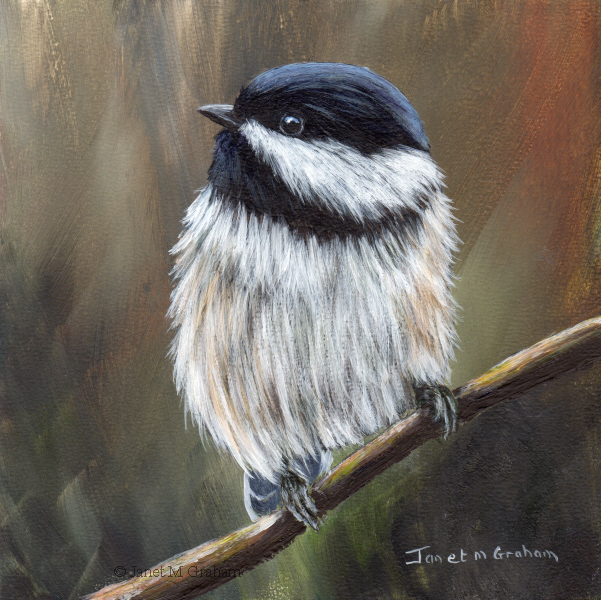 Carolina Chickadee measures 2.5 x 3.5 inches and is painted on Colourfix Smooth Paper. I decided to paint another Scarlet Robin from using one on my reference that I took last year in Tasmania. 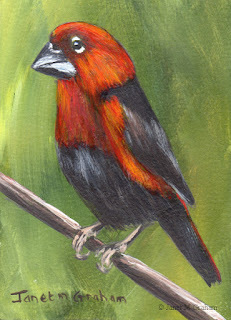 I do just love their bright and vibrant red feathers. 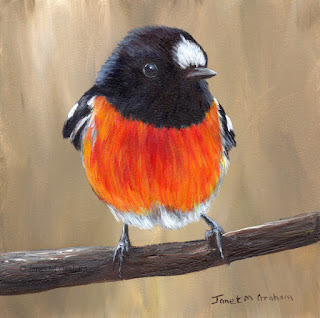 Scarlet Robin No 5 measures 5 x 5 inches and is painted on Colourfix Smooth Paper.